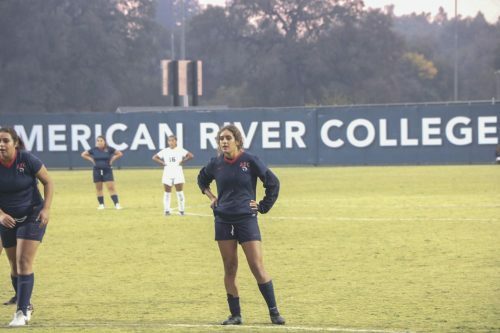 The women’s soccer team at American River College has seen its fair share of players sidelined due to injuries this season. This list of inactive players kept growing as former captains also saw their seasons cut short. 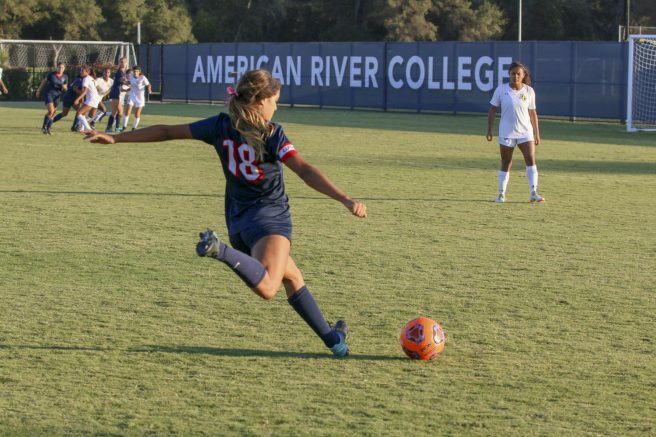 This left shoes to fill, and with the positions being vacated, the opportunity to step up arose with it, giving sophomore Savannah Tijerino-Santos the chance to fill the captain position early this season. Since several players have suffered injuries, Tijerino-Santos embraced the new title bestowed upon her. She leads the team in goals at this point in the season, but doesn’t equate her personal success and being captain to other players not being able to lead. “I think anyone could be a leader, it doesn’t matter if you have the title of captain or not,” Tijerino-Santos said. The responsibilities that come with a leadership role are new for Tijerino-Santos. However while juggling the expectation to lead her team, she has not forgotten the basics of being a good teammate and knows how far support goes. When the search for a new captain began, the only thing Santos lacked overall was the official title, according to the team’s head coach Paul Arellanes. For him, the decision to utilize Tijerino-Santos as a captain was a simple one. The strengths Arellanes says he noticed in Tijerino-Santos are not ones that came out of the blue or without growth. Since last season, Tijerino-Santos has been able to make strides and give herself to the sport more, Arellanes said, and the results are showing on the field. “She sees the game better, her movement off the ball and the way she thinks about the game, and I think she’s a little more committed to the game,” Arellanes said. “I think she realized, she wants to go play at a four year (college), and she’s definitely got the ability to, and she kind of made a commitment to herself to do it, and it’s shown on the field,” Arellanes said. Today, Tijerino-Santos is the acting captain of the women’s team, however her abilities on the field began to form as early as eight years old when her parents wanted her to get out all of her energy. “The whole reason I got into soccer in the first place was because I had ADHD when I was younger, and my parents wanted to put me into something to take my energy out,” Tijerino-Santos said. Athletics have always played a large role in Tijerino-Santos’ life; both parents were athletes when they were younger, so the sports route seemed right to her. She says around middle school however, basketball was another interest of hers next to soccer, but her passion for soccer prevailed. “I played basketball for a little bit, but I stopped that in [my] sophomore year of high school, because I wanted to focus on soccer more, and I knew I was going to have to pick between the two,” Tijerino-Santos said. This lifelong passion Tijerino-Santos possesses keeps her searching for more every game. On game days, before she dons the No. 18 jersey, Tijerino-Santos can be found relaxing and listening to music. However, when it’s time to hit the field, Tijerino-Santos says she is always looking to deliver the best version of herself through her drive and aspirations to improve on her previous game. The path that Tijerino-Santos has been on her whole life was paved in her time spent on the soccer field. All the time and passion has been building for years and Tijerino-Santos is now seeing the results as a Beaver, and this is just the beginning. While her skills as an individual show every time she laces up her cleats, Tijerino-Santos still only has one thing in mind every time. Felix Oliveros is in his first semester as a staff writer for the Current. He is currently majoring in communications with a concentration in mass media. He plans to transfer to a California State University in the spring of 2019 with the hopes of reporting and covering his passions such as sports, fashion, culture and, especially, music. Be the first to comment on "Soccer captain leads team in goals"